Most tropical corals, like other cnidarians, contain a symbiotic algae called zooxanthellae, within their gastrodermal cells. The coral provides the algae with a protected environment and the compounds necessary for photosynthesis. These include carbon dioxide, produced by coral respiration, and inorganic nutrients such as nitrates, and phosphates, which are metabolic waste products of the coral. In return, the algae produce oxygen and help the coral to remove wastes. 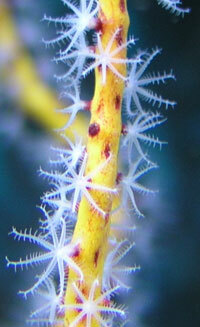 Most importantly, they supply the coral with organic products of photosynthesis. These compounds, including glucose, glycerol, and amino acids, are utilized by the coral as building blocks in the manufacture of proteins, fats, and carbohydrates, as well as the synthesis of calcium carbonate (CaCO3). The mutual exchange of algal photosynthates and cnidarian metabolites is the key to the prodigious biological productivity and limestone-secreting capacity of reef building corals (Barnes, R.D., 1987; Barnes, R.S.K. and Hughes, 1999; Lalli and Parsons, 1995; Levinton, 1995; Sumich, 1996). The same coral as above, but bleached with all the zooxanthellae expelled. 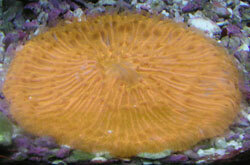 Zooxanthellae often are critical elements in the continuing health of reef-building corals. As much as 90% of the organic material they manufacture photosynthetically is transferred to the host coral tissue (Sumich, 1996). If these algal cells are expelled by the polyps, which can occur if the colony undergoes prolonged physiological stress, the host may die shortly afterwards. The symbiotic zooxanthellae also confers its color to the polyp. If the zooxanthellae are expelled, the colony takes on a stark white appearance, which is commonly described as “coral bleaching” (Barnes, R.S.K. and Hughes, 1999; Lalli and Parsons, 1995). 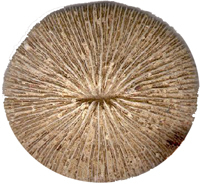 Coral calcium is calcium carbonate, which a chemical compound, with the chemical formula CaCO3. It is a common substance found as rock in all parts of the world, and is the main component of shells of marine organisms, snails, and eggshells. Calcium carbonate is the active ingredient in agricultural lime, and is usually the principal cause of hard water. It is commonly used medicinally as a calcium supplement or as an antacid. Many people are familiar with the coral reefs that thrive in shallow, well lighted, clear tropical waters where myriad colorful hard and soft corals provide habitat "infrastructure" for numerous invertebrates and fishes. The corals provide protection and cover, sources of nutrition, and sites for reproduction. Corals, however, also grow in the deep, cold sea. Although the existence of some of these deep-sea coral thickets has been known for several centuries, initially from pieces of broken corals brought up with fishing gear, scientists know little about their distribution, biology, behavior, and function as essential habitats for fishes and invertebrates.